In 2018, SOS is partnering with leading animal artist Claire Thorogood on "A Painting for Life" - a project which will help save lives as well as creating beautiful paintings that will last a lifetime. 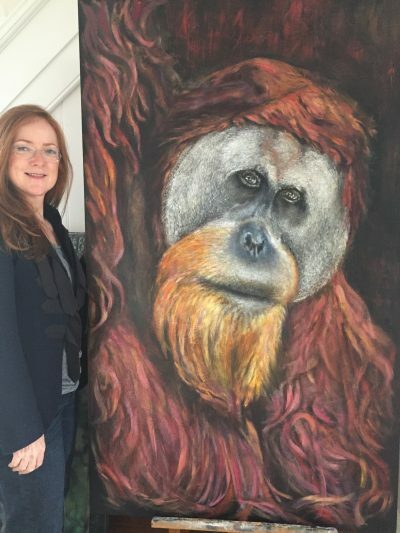 Claire is working on an ongoing body of work featuring portraits of Sumatran orangutans, with 50% of the sales proceeds going directly to help fund the care and protection of orangutans in Sumatra. You can follow Claire’s progress on each collectable original artwork, as she will share photographs and videos and talk a little bit about the story behind the painting as it progresses. So as well as hearing about some of the orangutans’ individual stories, you will also see how Claire brings out the unique personality of the orangutans through her painting techniques. The original artworks are available to purchase, with limited edition museum quality giclee prints also available. You can browse the artworks that Claire has painted so far below. If you want to be the first to hear about new orangutan artworks, make sure you join our mailing list and follow us on social media! A supersized portrait of this very handsome male orangutan. The scale of this piece, the fine brushwork bringing out his features, along with his pose portray his deep emotions. Krismon is painted on a wooden structure with stained and varnished sides and makes a beautiful statement in any room. Museum quality giclee prints also available here. A touching portrait of a group of infant orangutans expressing innocence and optimism. These young orangutans are brought to life using a roller technique on the stretched cotton gallery style canvas that can be hung directly on the wall. This unusual technique highlights their cheeky expressions and brings a real texture and relief to the piece. A beautiful female orangutan with a soulful glance, painted on a gallery style stretched cotton canvas, that can be hung directly on the wall. A very strong image of a little infant who looks full of life. Her lovely pout is brought out with loose brushstrokes in acrylic paint, and the portrait is painted on a beautiful wooden structure and can be hung directly on the wall. If you would like to commission a custom size piece of artwork, please click here for more information. To purchase museum quality giclee prints, click here.